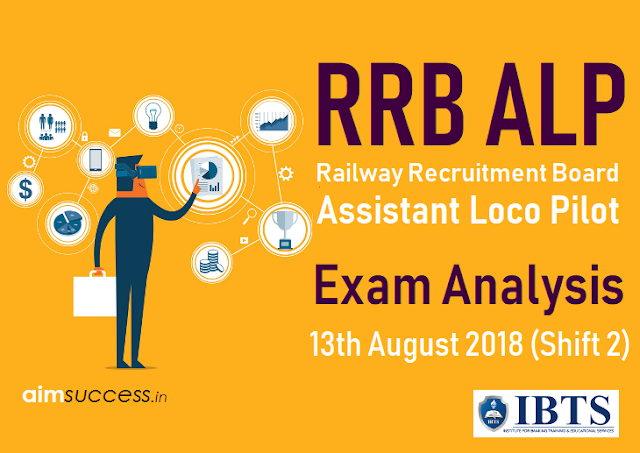 Railway RRB ALP Exam Analysis: Today (13th August 2018) Third Day of RRB ALP & Technician Exam Conducted by Railway Recruitment Board (RRB) and it will continue from 09th August to 31st August 2018. Here we will provide you the complete with a detailed section-wise analysis of Railway RRB ALP Exam Analysis 13th August 2018 (Shift 2) exam paper. In Railway ALP Exam 2018, Mathematics was of Easy Level. Most of the questions were based directly on Formulas and some were calculative. In Railway ALP Exam 2018, General Intelligence(Reasoning) questions were of Easy-moderate level. There were only 1 questions from image. One question from clock, in which angle was asked. In Railway ALP Exam 2018, Questions from Science were directly based and of easy to moderate level. No formula applying questions were the part of the exam. In Railway ALP Exam 2018, General Awareness on current affairs questions were of easy level. IBTS INDIA - India's Leading Institution for SSC Exams.